BIRATNAGAR, Jan 18: Revenue mobilization by the Biratnagar Customs Office, which was affected due to collapse of a bridge in bordering India due to August floods, is finally coming back on track. Revenue collection from the customs office slowed in the first two months of Fiscal Year 2017/18 after movement of cargo vehicles was affected due to collapse of Mirgunj Bridge on the Jogbani-Bathnaha road, a key trade route, in India. Because of the bridge collapse, cargo vehicles had to be re-routed, causing slowdown in revenue mobilization. The customs office mobilized total revenue of Rs 13.83 billion over the first six months of FY 2017/18 which ended in mid-January, 2018. The office had set a target of collecting Rs 14.37 billion in the six-month period. Customs officials say revenue collection was affected because of the bridge collapse in India. 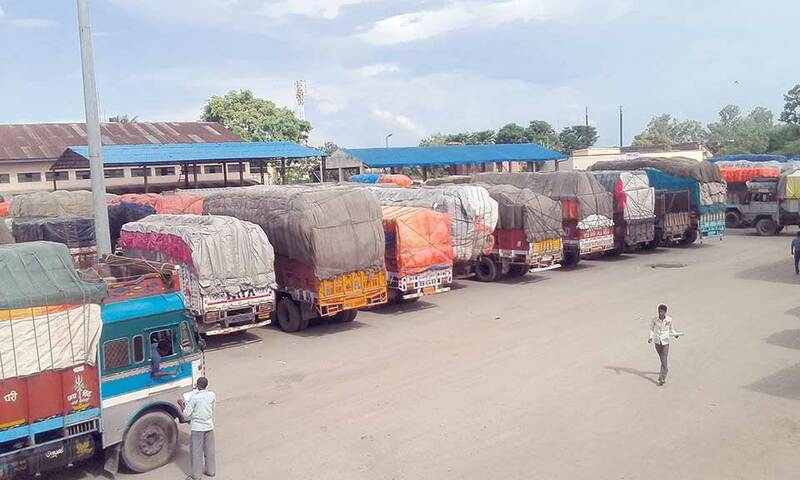 “We could mobilize only 96 percent of the targeted revenue because the obstruction in trade route due to bridge collapse hampered revenue collection in the first two months of current fiscal year,” said Mimamsha Adhikari, chief of Biratnagar Customs Office. The customs office could collect only Rs 1.7 billion of the targeted Rs 2.2 billion in the first month of FY 2017/18, while collection in the second month stood at Rs 1.87 billion compared to the monthly target of Rs 2.49 billion, statistics of the Biratnagar Customs Office shows. The office, however, met the revenue target in the latter four months. In the third month of FY 2017/18, the office collected Rs 2.52 billion against the target of Rs 2.18 billion. Similarly, in the fourth month, it mobilized Rs 2.7 billion even though the target was only Rs 2.49 billion. 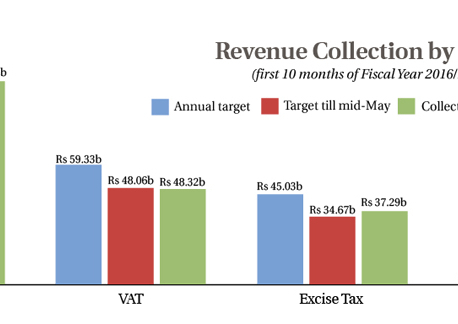 Revenue collection surpassed the target in fifth and sixth months as well when the office mobilized Rs 2.50 billion and Rs 2.52 billion, respectively. The target for both the months was Rs 2.49 billion. Though the Mirgunj Bridge has come into operation after repairs, it supports movement of vehicles of only 20 tons. Biratnagar Customs is the third largest customs office in the country in terms of revenue mobilization. Major commodities imported through the customs point are petroleum products crude soybean oil, motorcycles, betel nuts and coal etc. Similarly, major goods exported through the customs office are betel nuts, cardamom, woven fabrics, jute bag, GI wire, dyed yarn, and brass strip in coils etc.